Has patient had spine surgery? What was done? When was it? Have you had chiropractic treatments? Has patient seen a surgeon for a present problem? What was recommended? What tests and treatment has patient had? Where and when did you have your latest MRI scan? Are you going to have your MRI scan report faxed to our national receiving fax at 310-659-8869? Do you or did you stress your back in your work? 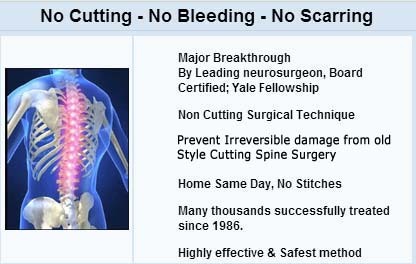 We are the foremost center in the world for Non-Traumatic Spine Procedures. 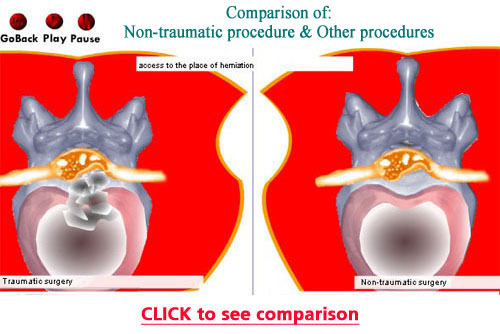 These procedures are totally non-traumatic in their access for removal of a bulging or herniated discs. 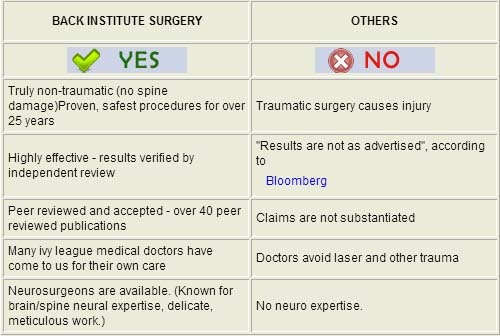 These are the most advanced non-traumatic procedures available anywhere, beyond "minimally invasive." We are the world leader in these procedures and our approach is not available at any other facility.